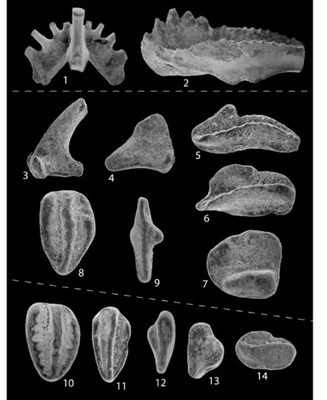 Conodonts (Phylum Conodonta) were worm-like marine animals that are best known from their microscopic, phosphatic tooth-like jaw elements that occur in considerable abundance in many marine rocks. Conodonts range from Cambrian to Triassic. They have been important index fossils for correlating strata. Limestones and calcareous shales treated with acetic acid yield residues of conodont jaw elements, along with microscopic vertebrate remains. They are found in Ordovician through Pennsylvanian marine rocks in Ohio. Sweet, W. C., 1996. "Phylum Conodonta," in Feldmann, R. M., and Hackathorn, Merrianne, editors, Fossils of Ohio. Ohio Division of Geological Survey Bulletin 70, p. 262-269, 1996.